Sensory play gives children an amazing opportunity to explore the world around them. Sensory play is usually associated with messy play. However, not all children (or parents) like this form of play. 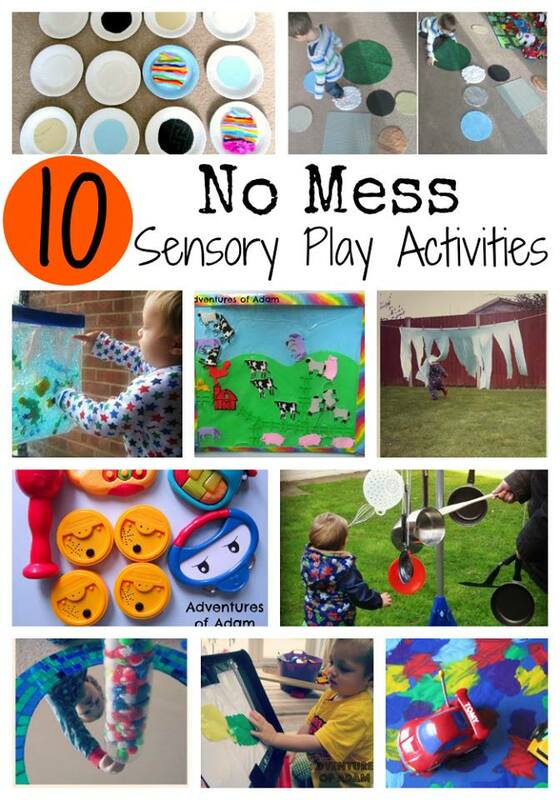 If you can’t stand the mess or if your little one doesn’t like to get their hands dirty then here are 10 no mess sensory play activities. 1. Texture Lotto Game – attach different textures to paper plates to create your own texture lotto game. We used cotton bed sheet, bubble wrap, sand paper, felt and a rubber mat. Can your little one match the textures? 2. Textured Stepping Stones – stick various textures onto pizza polystrene disks to get your child to explore the sense of touch with their feet. We used artificial grass, lego board, felt, wood laminate, tin foil and sand paper. My son loved jumping between each texture circle. 3. Fish Tank Sensory Bag – Pour cheap blue hair gel into a zip-loc bag, cut out fish and seaweed from craft foam and stick the bag to the window. Your little one can move the fish around the tank without getting their hands messy. The sun will warm up the hair gel to give a different sensation too. 4. Farmyard Sensory Bag – Using baby oil, foam stickers and craft foam in a zip-loc bag you can create a farmyard scene. The animals can be herded into their field – a great activity to develop fine motor skills. 5. Washing Line Fun – Cut strips in an old large towel and hang it from the washing line. Your little one will love running in and out of the slits and the material feels great on their faces. 6. Sound Matching Game – Talking Tins are brilliant devices which enables you can record up to 20 seconds of sound. We used ours to create a sound matching game with musical instruments and farm animal sounds. 7. Musical Tree – To explore the sense of sound why not hang your pots and pans from a laundry tree or fence. Get your little one to experiment with the different sounds that different kitchen utensils make on each item. 8. Pom Pom Mirror Drop – Place a mirror on the floor, cut the bottom out of a plastic bottle and get your little one to drop pom poms through the hole. Watch their faces as they see the activity in the reflection too! 9. Non-Messy Paint Mixing – If the thought of getting the paints out with your young child petrifies you then why not try non-messy paint mixing. Place paper into a zip-loc bag, pour in paint and sellotape the bag up. Your little one can mix the colours together using their fingers, cars of any other toy. 10. Remote Control Car Painting – Drop small amounts of paint on a surface and place clear plastic on top. This makes a great area to paint with remote control cars without getting the tyres covered in paint! During a difficult pregnancy suffering from Hyperemesis Gravidarum (HG) Emma vowed to make every day an adventure once she had recovered. Adventures of Adam is the outcome of completing a 100 day play challenge with her toddler as part of that promise. Emma has a section dedicated to HG friendly play activities so that Mums can still be part of their children’s play whilst they are ill. Follow Emma on Facebook, Twitter, Pinterest and Instagram.